How can you be sure that your VoC initiative stays fresh and relevant? Continuous improvement is just important for your VoC initiatives as it is for your entire customer experience journey/transformation. What are you doing to ensure that your listening efforts are always fresh and relevant? Yes, even customer listening programs become stale and must be updated. You've made changes to the experience that you want to measure and track; there are emerging trends in the industry and with customer needs; customers change, and new customers come into the fold; and you're offering new products and services. If you're using the same survey you did a year ago, it's time to check that. But listening programs are not just about surveys, and even if you continue to use surveys, there are much more innovative approaches to surveying than a year or two ago. Mobile survey capabilities have evolved, such that all surveys are now mobile - there's no distinction between desktop, mobile, and in-app. (What? Your surveys aren't mobile friendly? Time to get on that!) Don't forget short, simple text surveys, as well. The timing of mobile surveys is another consideration; no longer is post-transaction the only (or even the best) way to capture customer feedback. Consider brief, in-the-moment surveys that allow you to get feedback while the customer is, well, in the moment of the transaction or experience. And surveys are becoming more like a conversation. Some providers are offering more-dynamic surveys, where they've incorporated predictive capabilities that go beyond the traditional skipping and branching approaches of yesterday. Also, I've seen folks take new approaches to designing the surveys. Don't assume you know what's important to your customers. Traditionally, we might have designed surveys with attributes that were derived from customer conversations, focus groups, or simply from what we knew/heard about the experience. Lately, companies have been asking open-ended questions and then analyzing those comments to identify not only attributes but perhaps emerging trends that should be fleshed out a bit more through the surveys. Lastly, don't just use surveys. Use other methods to listen to customers, as well. There are so many options, some qualitative, some quantitative: online communities, online reviews, customer advisory boards, social media, and more. Important to note is that you don't want to make it cumbersome for customers to provide feedback. Make it easy; offer forums and feedback options in places where your customers prefer to be; and, finally, act on what you hear!! Today I'm pleased to share a guest post by Rae Steinbach. Good internal communication can make a big difference for any company. A failure of communication can cause projects to fail, increase costs, and can contribute to an atmosphere of discontent among your staff. For so many businesses, the drive to develop an effective feedback loop only comes after a failure has made the need for change obvious. Instead of waiting for a disaster, you can follow some of these tips for solving problems with internal communications. You want to start by thinking about how you introduce new employees to the company. So many companies just throw new employees into the job and expect them to figure things out as they go. If you want employees to fit in and understand the workplace culture, you should start them out with some type of training or orientation. You want to train them on their job and familiarize the new employee with their responsibilities, but there is more to it than that. Teach them about the internal dynamics of the company, the company culture, and protocols for different internal processes. Waiting for them to learn the ropes on their own is inefficient. By taking the time to get them ready for the job, you can instill the attitude that contributes to a positive workplace culture from the beginning. Every company should have some kind of mission statement and a vision of what they stand for. What are your goals as a company? What principles do you want employees to value in their work? You need to answer these questions and make sure that these ideas filter down to every level of the organization. Get a team of company leaders together to work on these answers. Share your ideas and develop a short statement that represents these values. Communicate this to all of your employees and find ways to instill a sense of this vision in every person at the company. 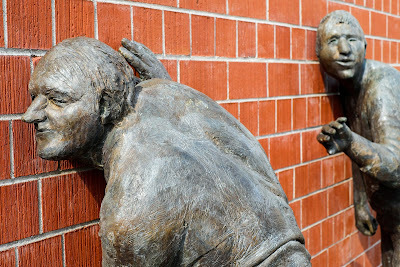 You need to encourage your employees to share their thoughts. Employee feedback is important and can provide valuable insights. You don’t want people to feel like they have to keep their concerns to themselves. Make sure they know that you are always willing to listen to feedback and that you are willing to consider any idea. You might want to keep everybody working for every hour that you have them at the office, but it can be beneficial to take some time away from the job. Take your employees to do something fun. When they get some time away from the office, they can build bonds that will carry over into their work. This can improve internal communications and help to build a more cohesive team. Most companies have common questions and procedures that people are going to need to refer to regularly. 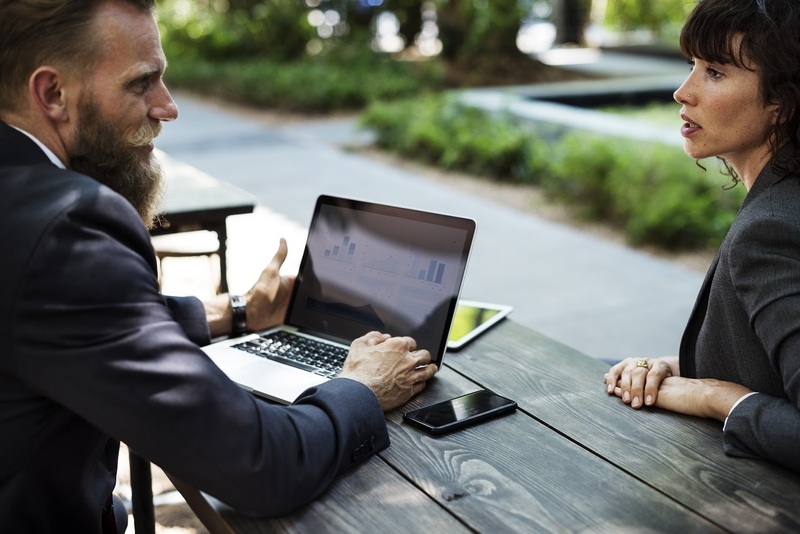 Instead of answering these questions and explaining these procedures every time they come up, develop internal references that employees can access when they need them. Build something like a company FAQ that answers common questions. You can build a core FAQ to begin with, and as new issues arise, you can add to the resource. With improved internal communications, you can run a business that is more efficient. Employees will be able to work together in a way that is more effective, and it can also make for a workforce that is more content in their jobs. You just need to commit to the concept of better communications and take the proper steps to make it a reality. Get the journey mapping process right, and you'll reap the rewards for a long time to come! Last week, I wrote about the session I hosted for Quadient's 2nd CX Transformation Day. It was a great hour, during which I busted five myths about journey mapping and interviewed a panel of experts on their experiences with journey mapping. While I talked about five myths last week, we know that there are a lot more than that. I thought I'd take a moment to share six more that need to be busted, as well. 1. I've mapped the journey myself; I don't need to involve anyone else. First of all, actionable maps cannot be created in a vacuum. By definition, the mapping process is a collaborative effort that brings different departments together to build that initial assumptive map: for discovering, learning, and sharing. This is where maps help to break down silos. Second, and probably more importantly, the touchpoint doesn’t operate in isolation. So thinking you can develop a map that wasn't done in conjunction with other departments, is erroneous. For example, think about buying a car: sales isn’t the only person/department involved; financing, service, parts, etc. are also involved in the experience. 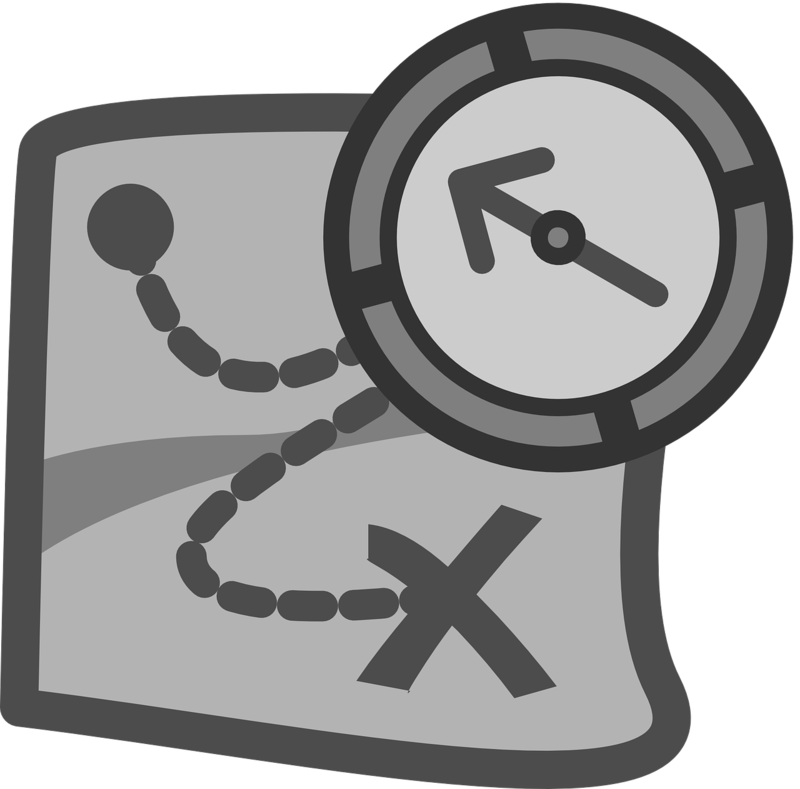 Mapping in your silo doesn't afford others to bring their perspectives and artifacts into the map at the appropriate place along the journey. 2. We created an assumptive map and are ready to redesign the experience. Once you've created the assumptive map, you must have the map validated by customers. If you don't, you're simply perpetuating inside-out thinking and are on a path to designing an experience that will definitely not meet your customers' needs. 3. It's OK to start with a future state map. Definitely not. You can't transform something you don't understand. How can you design the future state if you don't understand the current state, i.e., what's right and wrong. Start with today and then work toward tomorrow.If you don't know what's wrong, how can you make it right? 4. Buyer personas and CX personas are one and the same. Marketing and customer experience professionals have different needs when they are developing and using personas. The personas are developed in much the same way, with lots of research, but CX professionals' personas have additional information that allows them to design the experience for their customers based on: pain points, problems they are trying to solve, jobs to be done, etc. 5. Journey maps are used only for the customer experience. Journey maps are not only created for the customer experience but for any other constituent whose experience you are trying to improve, including: employees, vendors, partners, franchisees, and licensees. 6. Without a digital mapping platform, I can't even begin to map. You probably know by now that I'm a huge advocate of mapping via a digital platform, for a variety of reasons, not the least of which is that they (most of them) check the box for some of the basic tenets of mapping: collaboration, sharing, updating, communicating, incorporating data and artifacts, validation, and actionability. Having said that, you can still map without a digital platform; as a matter of fact, I often like to start my journey mapping sessions with butcher paper and Post-Its because it gets people: out of their seats and involved; up and thinking; and collaborating, questioning, and learning. It's more of a design-thinking, creative approach. I would, however, recommend that you get a digital platform sooner rather than later, as you'll become really frustrated the first time you need to roll up your butcher paper to take it to another location. Trust me! What are your thoughts? Do you have any other myths that you'd like to add? Journey maps are a catalyst for change. But only when done right! You've heard me say that before, and it's the truth. One map applies to all customers; all customers are the same. I don't need personas; I can simply map for major customer segments. Marketing has the same mapping needs as CX. Data has no place in journey maps. Brad Smith: former CMO/CCO at Symantec, Sage, Yahoo! We had an engaging discussion about how each one has used journey maps in their respective organizations to drive change for both employees and for customers. They shared tips on how to ensure maps are actionable, how to select which improvements to make based on map findings, who owns the maps and the next steps, how to measure success, and much more! You won't want to miss this discussion. Thanks to UCI Paul Merage School of Business for hosting us as we filmed this session. Act on What Your Customers Tell You! Are you acting on what your customers are telling you? Companies listen to customers but fail to make improvements to the customer experience as a result of what they hear. There are a few reasons behind that, including but not limited to: a lack of actionable data, analysis paralysis, and not knowing what to do next or how to execute. In the presence of actionable data, though, the next step (after analysis and answers) is to take action. How do we rally the troops around the insights and get them to take and own the action? It all begins with the data, doesn't it? And with that thought in mind, I prepared and presented a webinar with/for Fuel Cycle a couple weeks ago titled, Insight to Advantage: Driving Action with Your Customer Data. 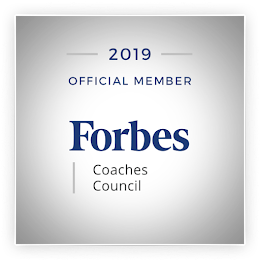 It covers the five steps you'll need to go through to yield the advantages that a customer-centric and customer-focused culture delivers. The webinar built on a whitepaper that I wrote for Fuel Cycle with a similar title. 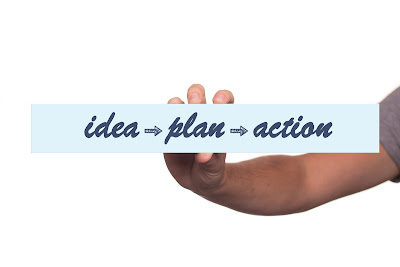 In that whitepaper, I go beyond the five steps and delve into one specific area, action planning and taking action. In it, I offer up steps to take- and a worksheet to use - to take insights to action... and to deliver results. I'd be honored if you'd take a listen to the webinar and read the whitepaper. I look forward to hearing your thoughts and feedback, as always. 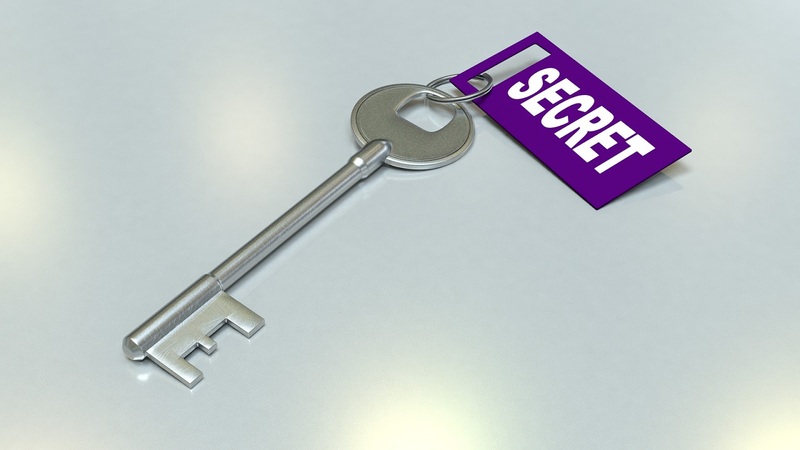 Do you know the top three secrets of VoC success? Strong Voice of the Customer (VoC) programs are a foundational element for any CX transformation. Transformations grounded in customer understanding lead to better outcomes for the business and for the customer. And so it was on that premise that I compiled the three secrets of VoC success for a recent CMSWire.com webinar, in advance of my keynote at DX Summit in Chicago this November. As a follow-up to the webinar, and again in prep for DX Summit, I was also interviewed by CMSWire.com about my background and my philosophy on customer experience success. Check it out. I don't think anything there will surprise you, but at the end I recommend a book that I think all CX professionals should read! Will you be joining Sue Duris and me for the first #CXchat of many to come? Sue and I talked about the fact that there hasn't been a Twitter chat dedicated to customer experience since #cxochat, which ended a couple years ago. Customer experience is such an important topic today that we wanted to come up with a way to continue to keep it front and center. We've had great participation with these chats in the past (and chats on related topics), so we knew it would be worthwhile to resurrect one dedicated to customer experience. 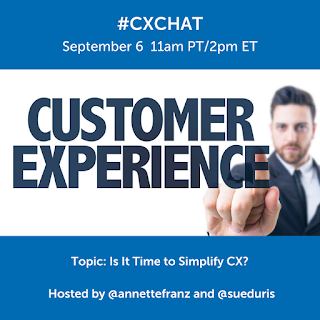 #CXchat will take place on Twitter every Wednesday at 11am PT. Simply follow that hashtag, and chime in with your thoughts, answers, experiences, best practices, etc. It begins on Wednesday, September 6, 2017. Sometimes we will have guests relevant to the topic, while other times we'll simply have a "roundtable" discussion. If you have a topic you'd love to see discussed, please reach out to either Sue or me, and we'll get the topic added to the schedule. We're trying to plan at least a month in advance. Set your calendar to join us on September 6 and every Wednesday thereafter! A little bit about our first chat, to get you primed for the discussion. As customer experience professionals, we are tasked with transforming the customer experience, to reduce effort for our customers. Let's think about ourselves today. How can we make our jobs easier?! How can we reduce effort when it comes to what we are trying to accomplish? To that end, we'll be addressing the following questions in the September 6 chat. What are some of the effortless things, if any, that we as CX professionals do? What's the easy part of our roles? A CX transformation is a lot of heavy lifting! How do we reduce the effort for CX professionals? Is it possible? What are the greatest challenges to success in your role? What have you done to try to mitigate or to overcome those challenges? Are there any tools that you use regularly to streamline or simplify any part of the CX transformation work you do? Think about your CX transformation. Your focus has likely shifted from delighting to understanding and meeting needs. without going the extra mile.How would you use that same approach to transform the CX professional's experience? Are there any books or resources that you'd recommend to other CX professionals that would give them a leg up on the work that lies ahead? If you've never been part of a Twitter chat, here's how it works. The chat begins promptly at 11am PT and lasts one hour. We will start with introductions. Say "hello" and introduce yourself as you join the chat. If we have a guest host, we will introduce that individual and then dive into the questions. To participate, all you need to do is tweet (answer the question, engage with participants) during the designated time using the #cxchat hashtag. Chat questions will be asked in the Q1, Q2, etc. format. When you respond, so that we can track your tweet/response to the question, please use A1, A2, etc. in response to the respective question. And don't forget to include the #cxchat hashtag! No selling of products or services. This chat is informative and educational. Buffer put together a great 101 resource about participating in Twitter chats. Check that out, if you aren't familiar with them or need a refresher. We look forward to tweeting with you on Wednesdays!